A while ago, in Andrew and Alex's room, there were these great blackout curtains. Well, when you have a crazy toddler and a wild (at the time) crawler...the curtains become a climbing apparatus, wind machine, parachute, and many other things. The screws in the will hold the rod up were no longer able to hang on and Jason and I took them down. For a while, there were no blackout curtains. This was all fine and dandy until the dang clocks changed. Bedtime can't happen when the sun is still out, mommy...Bedtime is now at 8. They still wake up at 7. No biggie. But something HAD to be done about the light coming in during nap time! So, I reused those blackout curtains and made blackout shades. They may not be perfect. But, two things. 1 - It's a boy room. They don't care. 2 - They work for the time being. The 2 curtains, awesome scissors, staple gun (didn't use it after all...) glue gun, pins, and sewing machine. Since I did this during nap time one day, I had to use the kitchen blinds as my guide. On our blind the front decorative piece comes off - I just switched these out with the ones in their room. I had to get the right width and pin down all the sides. Once I got the sides pinned, I cut it to the length I wanted (now I'm wish I kept a few more inches...oh, well.) and hemmed the end to make it look nicer. Once I got to the end, I realized that I needed to finish it off so it didn't bunch up weird. I'm not very good at sewing, so I am not sure what this finished seam is called. See? This side has the ridges to clip on the blind. I wanted to glue it to that side. And this is how they hung during nap time - the next day :) See how much light they block out?? Awesome. Now having them up there with no way of lifting them during awake time was annoying. But, we dealt with it for another couple of weeks - meaning taking them down and putting them back up. I didn't get the right amount of ribbon at first. So after an 18th trip to Hobby Lobby (a lot of stuff going on here! ), I grabbed the RIGHT amount of ribbon and here we have the finished product! Now you see what it looks like when it is up or down! :) What do you think? You did an amazing job with these. 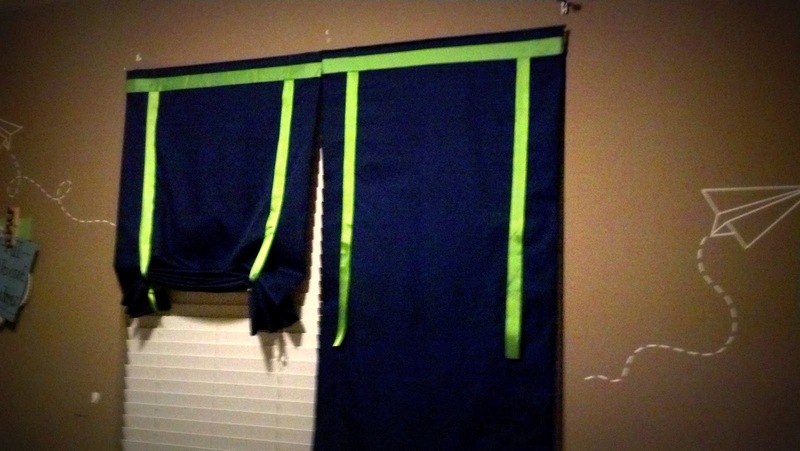 I need to do something similar for Riley's room because the shades we have up definitely do not do the job. I love the ribbon color that you chose. Thanks so much for sharing at Whimsy Wednesdays. Stop back tonight for a bloglovin blog hop. If you're unfamiliar with bloglovin you can find out all about it at www.thenymelrosefamily.blogspot.com/2012/02/i-heart-bloglovin.html. Those look great! and they look like they will add some extra minutes to nap time! Yea! Great job on these and thanks for linking it up @ Creatively Living!